Billiards Association (WPBA) Rivers Casino Open on Sunday, April 23.
pros in a one-on-one game. For more information about the WPBA and its players, please visit www.wpba.com. 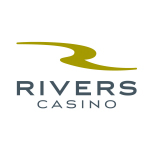 For more information about Rivers Casino, please visit www.riverscasino.com. performances, free parking and multiple promotions and giveaways daily. at Rivers Casino. For more information, visit riverscasino.com.